"How can I improve my PowerPoints?” - it’s a question we get asked frequently and we’re always happy to answer! How to turn PowerPoint into Video? 2. If you’d like to add audio to your slides, now is the time. You can do this by going to the ‘Insert’ tab and clicking the ‘Audio’ button. From here, you can upload pre-recorded audio or record audio for each slide right then. For each slide, repeat the process to add the audio you want. Alternatively, if you don’t want audio, just skip this step. Or you can convert your slides to video and use a tool like Camtasia to insert audio at a later stage instead. 3. Now it’s time to convert the slides to video. Go to the ‘Info’ tab in the ‘File’ section at the top of your screen. Click on the ‘Export” button. Here you’ll see ‘Create a Video’. 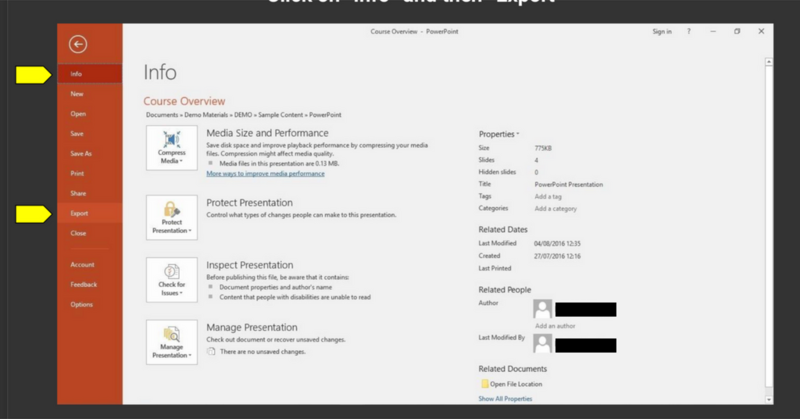 Click this and you’ll be shown export options including ‘Presentation Quality’ and ‘Seconds spent on each slide’. Pick the settings you want and then you’re ready to click ‘Create Video’ and you’re done! Note: The above screenshots are from a PC. If you are using a Mac the process is very similar. You click ‘File’ and ‘Export’ once again and you’ll be shown a drop-down of options you can choose to convert your slides. For video, pick the MP4 option to create your video. If you’re using Google Slides, you can also convert them to video by downloading your slides as a PowerPoint and following the above steps. 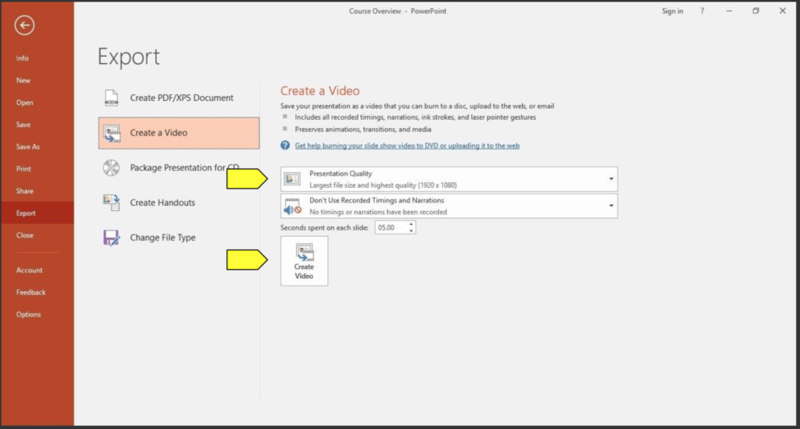 Why should you convert your PowerPoint to Video? One of the biggest benefits of turning PowerPoint to video is that it preserves the animation, transitions, audio or videos that you have added to your slides. Nothing is lost when you upload it to your learning management system so it looks as good as ever. An ordinary PowerPoint presentation, with no audio or video, can be a little unengaging. However, a video with audio, images and more makes your content come to life. Your learners are more likely to watch your video, absorb the information and achieve their learning goals. An invaluable feature that your LMS should have is video tracking. 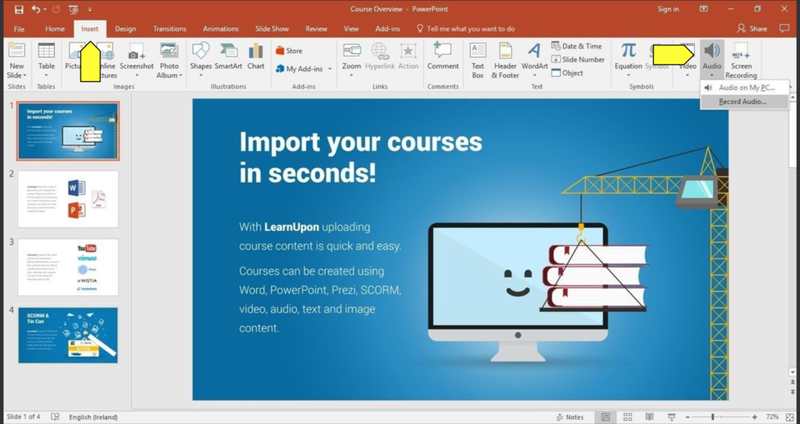 For example with LearnUpon when you add a video to a course and use video tracking, it means your learners have to watch your whole video. If they click to open a new browser tab, the video stops and it only continues to play when the learner goes back to the tab containing the video. It’s a handy feature as it ensures your learners actively watch every second of the video. 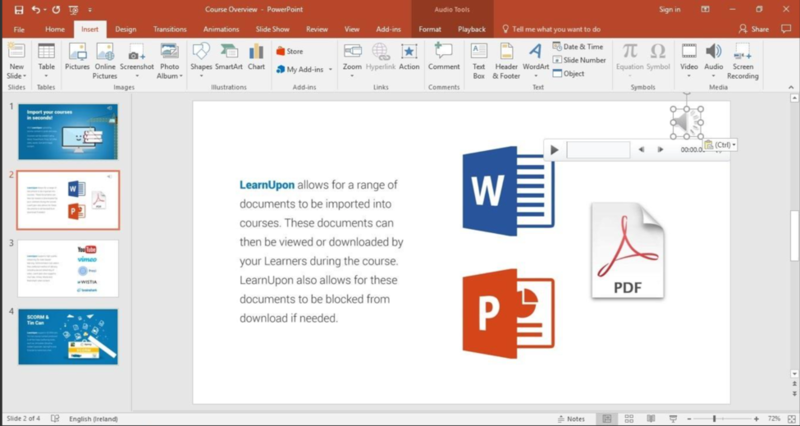 Converting your PowerPoint presentations to video is an incredibly fast and simple way to develop engaging, resourceful content for your training. Try it out and see if it works for you and your learners.